Faster Cheaper DIY Auto Repair Options: JUST pour-in-n-drive engine transmission radiator power steering fuel fuel-injector problem solvers. Selected because they're easy to use, fast acting, and work in new to even worn cars, trucks, and heavy equipment. What you should know about these Repair Options. Your do so here with my help! 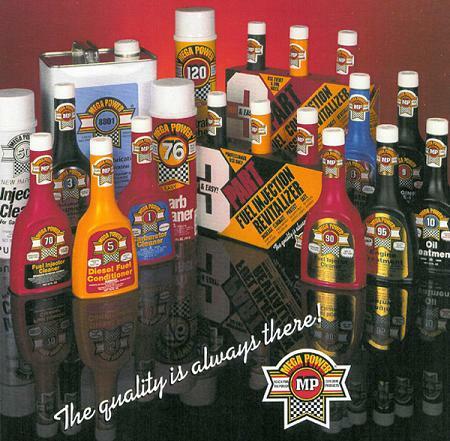 I'll help you chemically solving your vehicles wear and tear problem! These clean, free, smooth, and fill worn spaces to chemically return your car to its previous, great running condition! That's the medicine and vitamins you need and are offered here for your fix. With 30 some years specializing in what works and why, you gain the benefit by what's recorded in this site from that experience. Fast an inexpensively with this guaranteed method. Is that what you're after - read on? We separate the good away from the bad to help you. There are a dozen new high-tech products. I'll introduce the exact one to "fix your cars and equipment," that work because they are completely different from part store, quick lube, and mechanic sold products. The company producing such, is Mega Power. Mega Power invents and packages them. I'm the country's expert explaining their usage. Mega Power's Secret to its succes you need to have? Mega Power's Secret is their problem-solving additives that go where even synthetic oil can't go - to find and end the problem you car has.There Mega Power works to clean, free, heal, and cover with protectors - your pistons bearings valves gear seals and condition those parts -to the trouble spot to end the problem they developed! Because they end the restrictive negatives wear and tear and friction causes all other additives cannot - that is Mega Power's secret and difference compared to all other additives! When I say different, check out this Repair options video to see how so! Bookmark this page to return to find the fix remedy you need. Fast Cheap DIY Auto Repair Options including Pour-in-n-drive products to fix Engine transmission, radiator power steering fuel fuel-injector. Avoids actual repair need. The Repair Options for your problem can be found by clicking the buttons on the left. They have the fixes to end your problem! For personal help on Mega Power Products, Filters, or Oil... or Distributor Opportunity's, Call me. The page your problem covers, the “fix” for your car problem is spelled out in easy to follow steps.” Anyone can follow the directions to fix their vehicle problem. Overview below. Click a button for specific repair options. Just as there is medicine to cure your ills, so too, with your vehicles. The few out of the thousands that do work we have listed for you. Here is why. The reason why so few additives work is that those additives that do work requires a different chemical formula for that ailment. With dozens of combustion, fuel, tune up, piston, bearing, valve, and gear wear problems - guess what? There cannot be a common cure all product. The complexity to master the theory and practice of what chemistry to use for each problem is nearly impossible for a mechanic to master - and for you to find, without help. With 30 some years specializing in what works and why, you gain the benefit by what's recorded in this site from that experience. Each problem needs its own remedy, and I'm one of the few experts who know and want to help you end your car or equipment problem. So, when you read a tip to solve a problem that matches your cars problem, I'm right 100 times out of 100. That's why every tip and product here has a satisfaction guarantee! Amazed techs look on in disbelief. 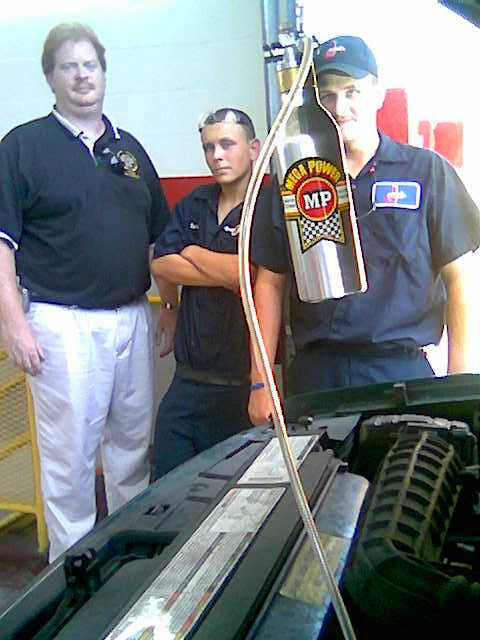 10 minutes later - after a road test - they knew they have a new car care and problem solving skill. Mega Power Additives are made into treatments for easy install by any man or women to end wear and tear caused problems. I'll show you how! Here's is why...my Repair options, tune up tips, work - or they are Free to you! It took me thirty years to master all of them. Now, you have that help at your finger tips, right here. What else is better about Mega Power's problem-solving chemistry technology? You already know some act like medicine. Now, Mega Power acts like vitamins for cars like vitamins you take do for you. Each fix is field tested to provide the the only way to give your car a better-than-ever running state, and have it last. These fixes and repair options are already helping thousands of car owners, and you, like them will buy the exact fix and the same promise of years longer dependability. Those, not possible in any other brand, and that all of us depend on, and use for our customers cars and trucks, every day. Or by component name; motor, transmission, steering, fuel, radiator cooling, air, tune up, etc. Spend 5 minutes reading to take advantages of the theory and fix explanations given for the cause and remedy of your problem. You will find the initial info you need as you read down this page. Receive updates, tips, special offers via our blog. Hit the Blog button. Scan the Home page contents List. Each specific headline gives the fix for the problem listed. Click on one of those that offer the help you need. You can always call me for what you need. In the page you’re after, the “fix” is spelled out in easy to understand “recipe like steps.” Anyone can follow the directions to fix their vehicle problem. Heat-activated cleaners work by going where oil can't go – to the root-cause of many problems. There, they undo such problems as leaks, valve tap, power loss, engine-miss, overheating, leaks, and transmission shift problems due to dirty, sticky conditions oil leaves behind, each time you change your oil. You might say they work much like cold and flu medicine does to clean your lungs, stop runny noses, end coughs, and to restore normal breathing again. Besides heat-activated cleaners, Mega Power research included several performance improving friction-modifiers, and co-polymers also proven to be good problem-solvers. When pared with heat-activated cleaners, friction-modifiers, and co-polymers a greater number of wear and performance problems can be corrected. Including brand new to older, and well-worn vehicles. They correct common wear and oil-breakdown problems occurring in brand new to One group resolves wear and power decline problems by smoothing wear-roughen piston, bearing, cam, valve stem, and gear surfaces. This end a common friction, and extreme-pressure-caused, rapid-wear-out problem, and their costly repair need. The other group of repair options delay overhaul need. Application in gears end growls, whines, and gearshift problems. They control oil consumption, and combustion blow-by problems. They work after the above cleaning and friction modifying is performed. These work to help end the above problems and others, by coating worn-away surfaces with special co-polymers. Coating worn-away surfaces correct wear and friction based engine, transmission, and gear worn problems. This chemistry works by attaching itself and one or two oil molecules to your worn surfaces. The result is an overhaul out of a bottle that last for years. The advantages you gain correct or end your problem and ends power loss and fuel waste by permitting as much as 10 horsepower to now pass thru to turn the wheels, instead of being absorb by the grinding action of friction, extreme pressures, and dirty conditions. As you see, by fixing the caused of your problem you’re also slamming the brakes on future wear out. These advantages will help your vehicle run more dependably, years longer. Thanks for becoming a customer. Call me on what to install in each vehicle for its age, mileage, amount of wear.